With the possibility of lows below 30 in the city each of the next two nights, it puts Philadelphia in contention to double the number of sub 30 degree nights it's had this decade. It's a trend that's becoming less frequent, in part to climate (general climate change plus a periodic warm Atlantic phase helping to "heat" the coastal plain a bit more effectively into November), partly also to increased sprawl in South Jersey and the suburbs that increases the size of the heat island. Going back to the "move" out to the Airport in 1940, the city has averaged anywhere between three and seven sub 30 mornings in a given year per decade. Some years do more than seven, some don't score any cold mornings at all. Per decade, the general average has been in the three to seven ballpark. Until last November, we had not seen a sub 30 morning in the city during the month since 2008. 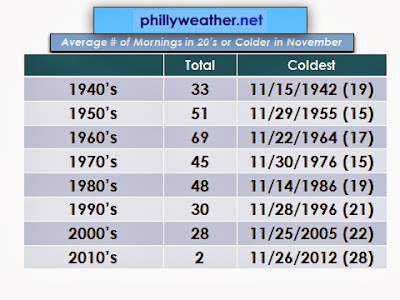 That's the longest stretch in the city since the early 1920's, when weather observations were taken in Center City. One other interesting statistic, beyond the trend towards fewer 20's in November at night, is that we have not experienced a sub 20 morning since 1986. Typically, we were good for one or two of these per decade until the 1980's. Since '86, we haven't had that kind of "luck" in the temperature department. Odds don't exactly favor us getting there this November either. That said, between the next two nights, Philadelphia does stand a decent chance of adding a couple of notches to the 20's belt in a decade that so far has been rather thin on such numbers.